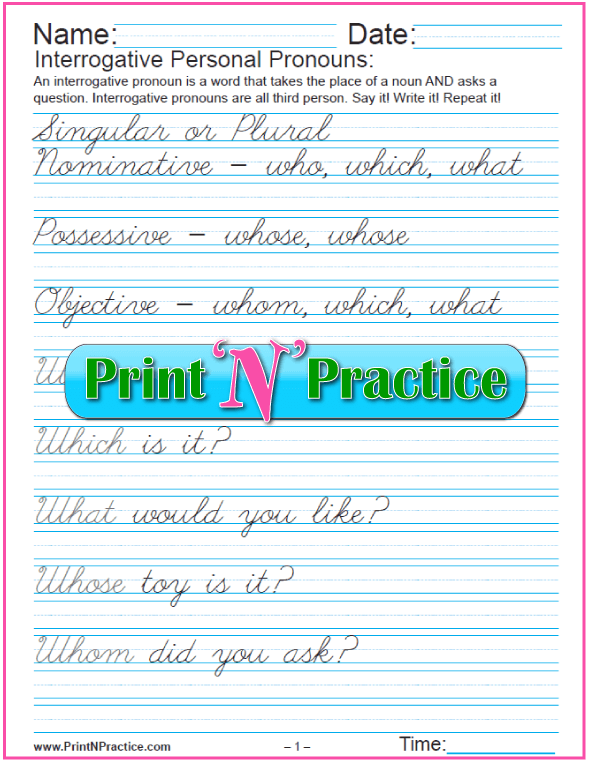 We have oodles of printable pronoun worksheets on this page: singular & plural, indefinite, personal, relative, reflexive pronouns and most kinds have a pronouns list. 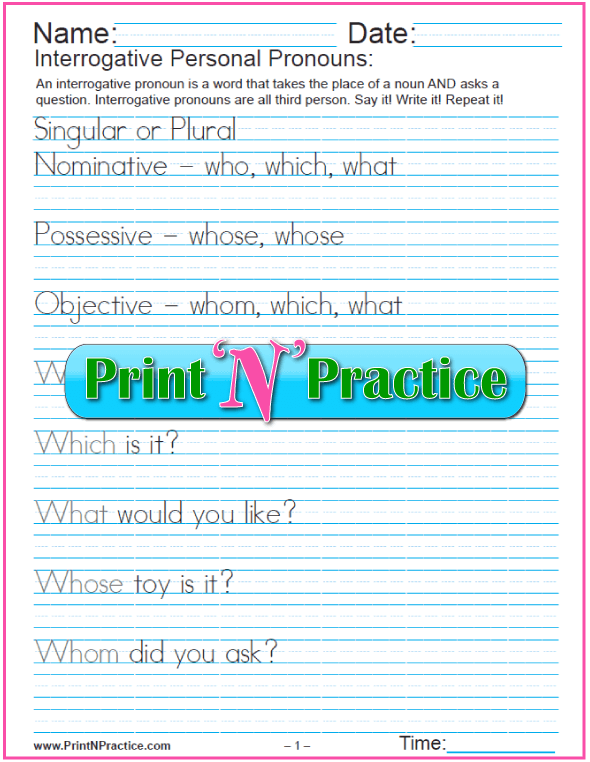 These will give your students examples of the main way that we use pronouns in sentences. 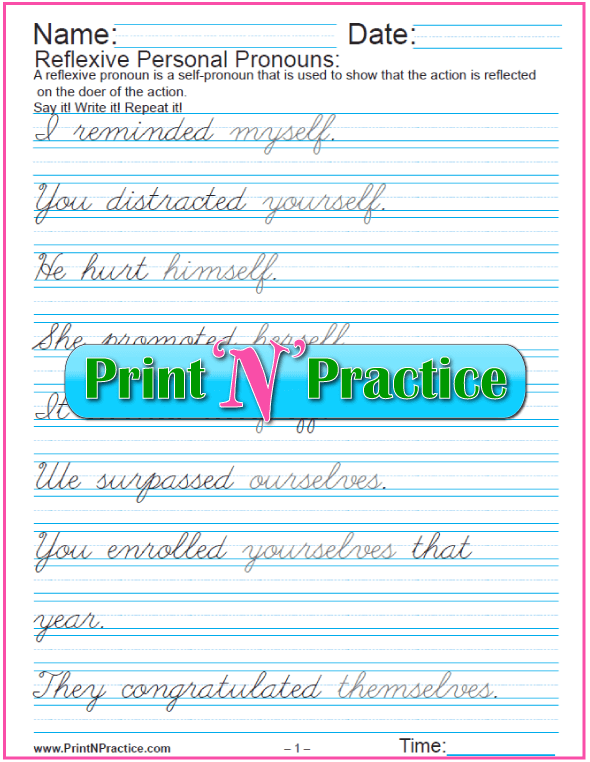 Also, most of our grammar worksheets also have a cursive version. 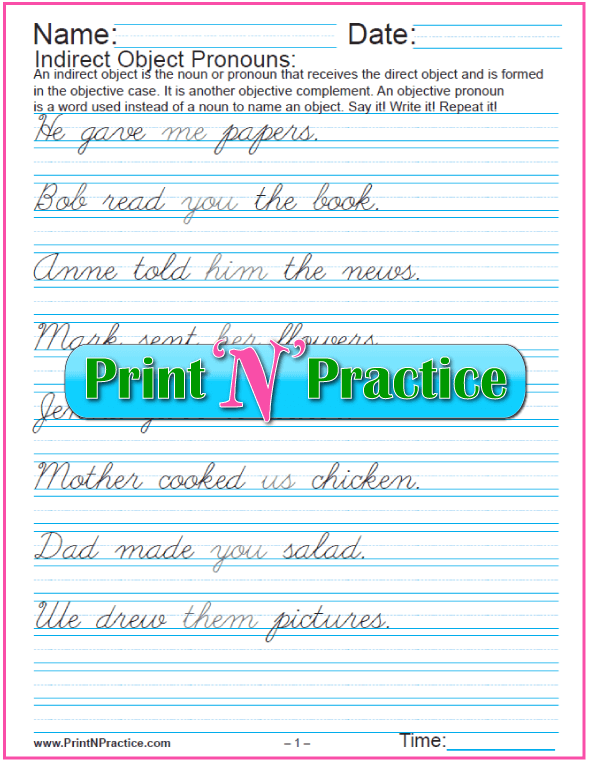 A pronoun takes the place of a noun and is used as a subject or object like a noun is used. John bats the ball. > He bats the ball. Mary sits nicely. > She sits nicely. 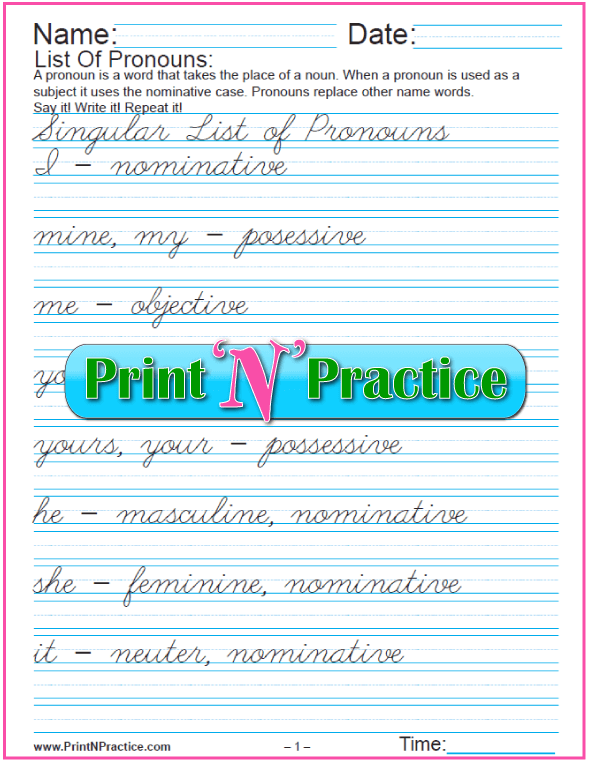 Pronouns take the place of nouns, yet it is handy to have a list of pronouns to be able to refer to or to memorize, since pronouns seem to keep their identity better than nouns and verbs! 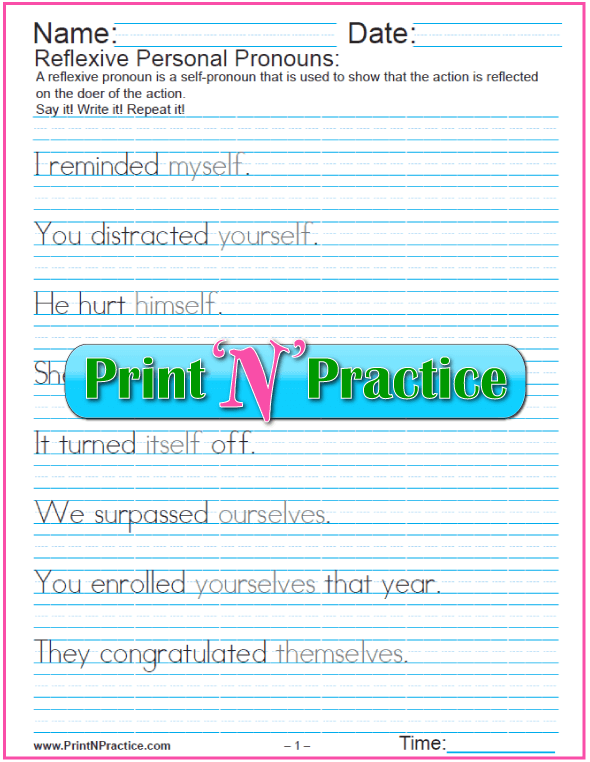 See below for the kinds of pronoun printables we have. Demonstrative pronouns can also be called indicative pronouns as they indicate whether things are near or close. These ideas come from home. Those ideas come from somewhere else. These pencils in my hand are close. Those pens in the drawer are far. 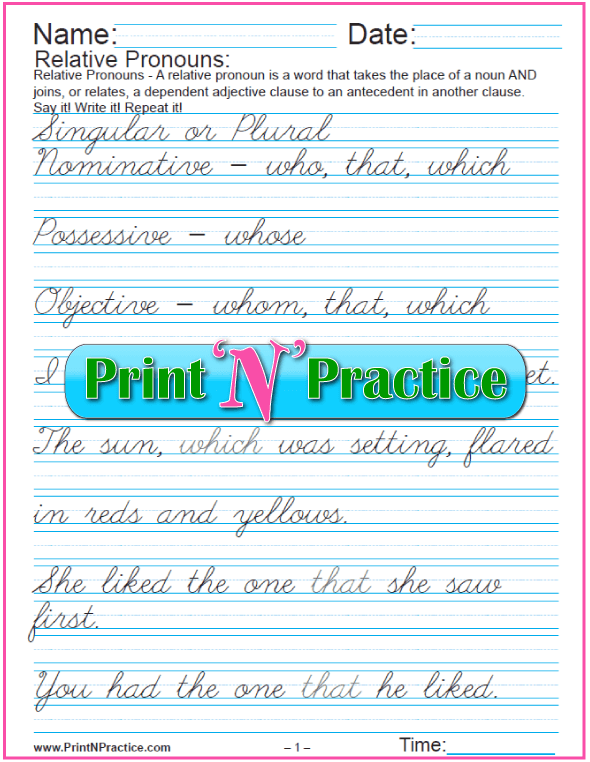 Demonstrative Pronouns with Cursive Writing Practice. Indefinite pronouns are inclusive, the word does not define a specific thing. In the negative, these pronouns include indefinite persons or things. An indefinite pronoun is a word that takes the place of a noun and takes the place of an antecedent that is not named and that cannot be named as a specific person or thing. 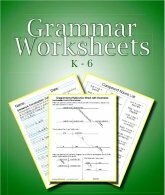 The first worksheet download here has two pages and the second has four. Each have a list of indefinite pronouns. 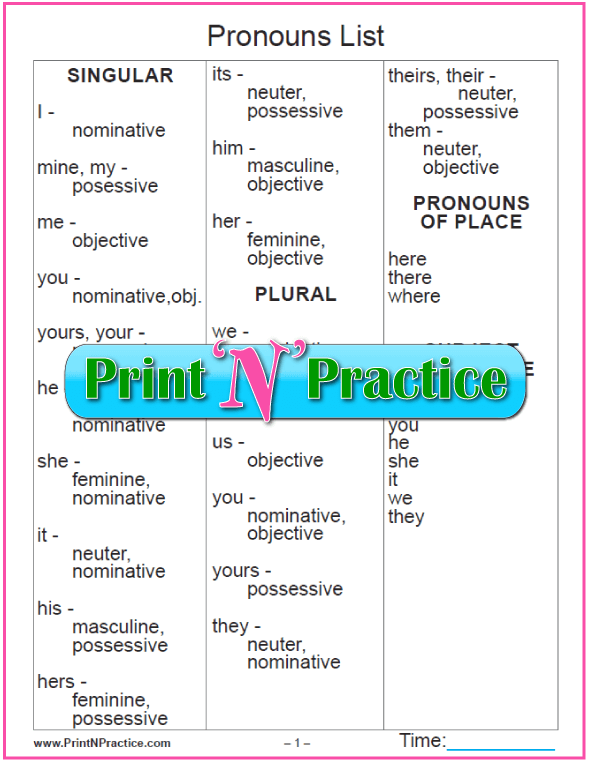 Objective pronouns are pronouns in the objective case and are easier to recognize than nouns in the objective because they have different spellings from the subjective or nominative pronouns. An objective pronoun is a word that takes the place of a noun (pro-noun) and is used as a direct object, indirect object or object of a preposition. Objective pronoun list: me, you, him, her, it, us, you, them, whom (people), what (things). 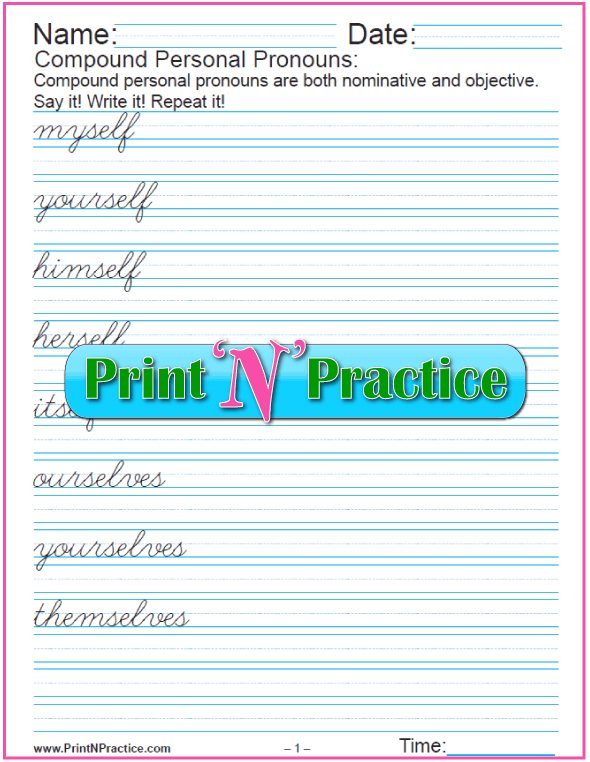 Have the children practice quickly with this objective pronouns list, one is in cursive. 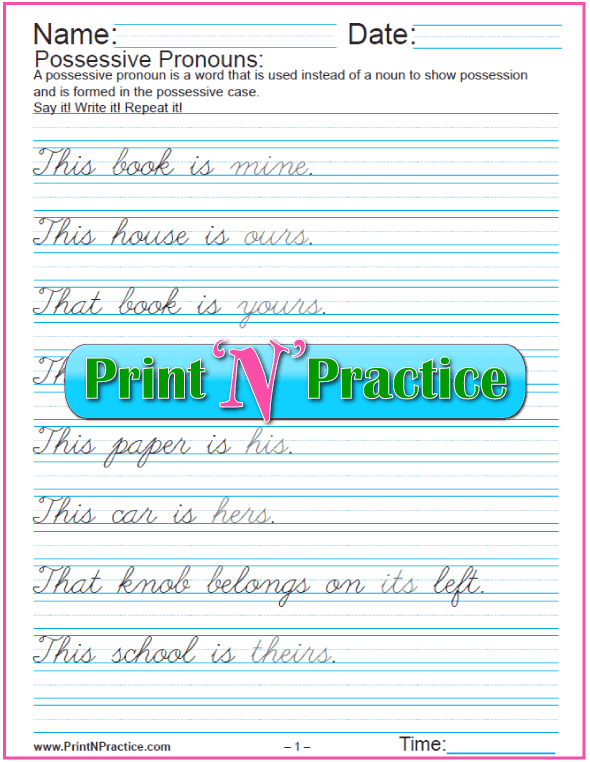 The second pronoun list includes the reflexive pronouns and has a cursive version, too. 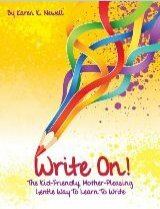 Sometimes quickly copying the list is a great way for children to remember object pronouns. 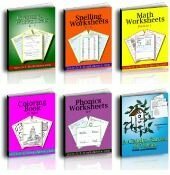 These sets of worksheets use objective pronouns in sentences. 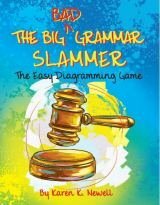 First come the direct objects and then the indirect objects. In these next exercises the direct and indirect object pronouns are written in gray where the rest of the words are written in black. 1. 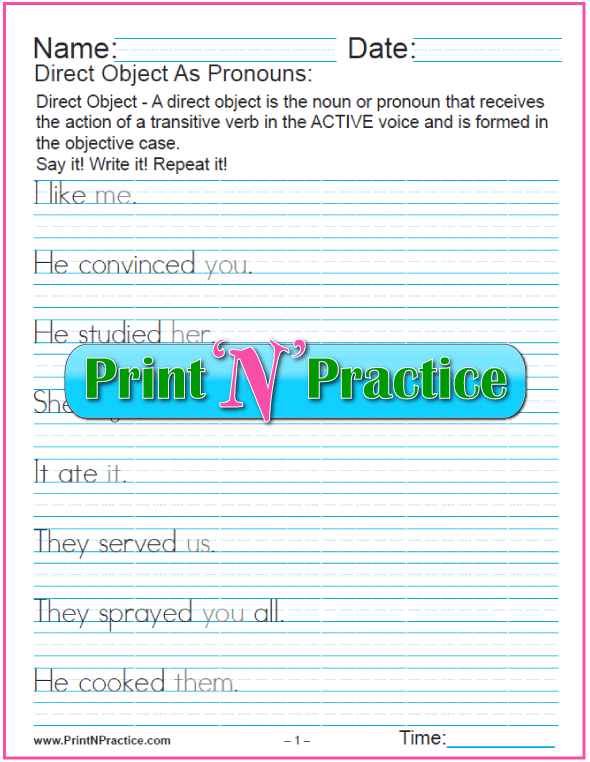 Direct Object - A direct object is the noun or pronoun that receives the action of a transitive verb in the ACTIVE voice and is formed in the objective case. 2. Indirect Object - An indirect object is the noun or pronoun that receives the direct object and is formed in the objective case. It is another objective complement. 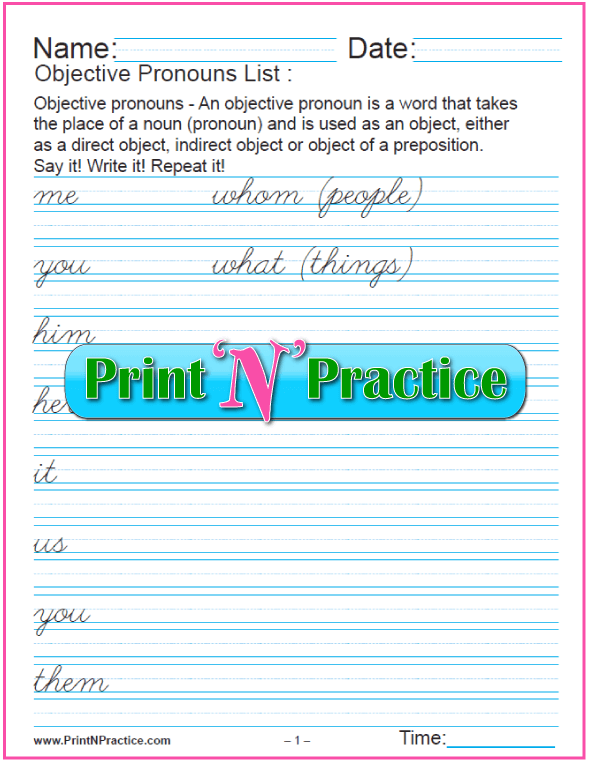 An objective pronoun is a word used instead of a noun to name an object. 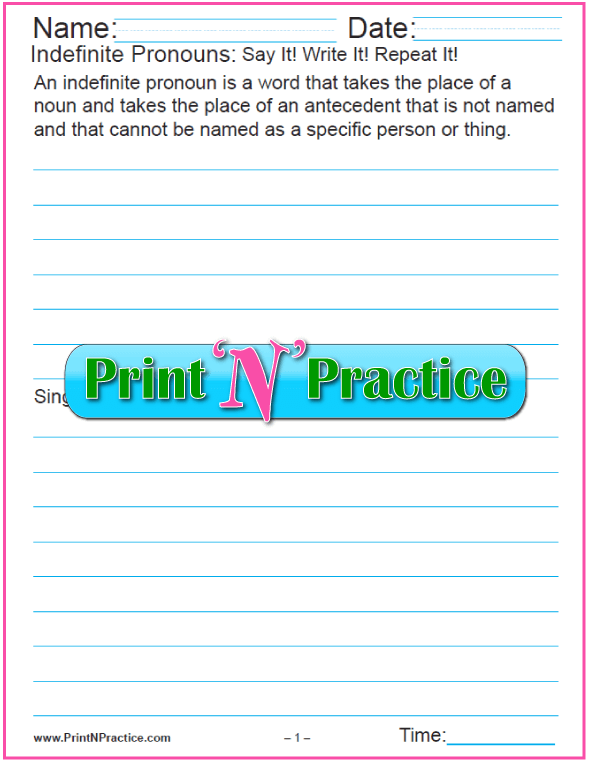 When a pronoun is used as a subject, it is in the nominative case (it names the person or thing acting or being). 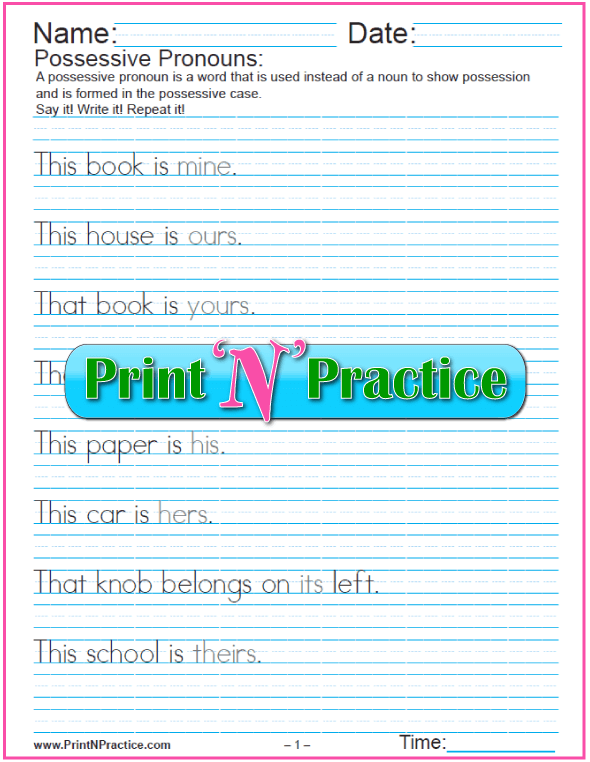 When a pronoun is used as an adjective showing ownership or possession, it is in the possessive case. 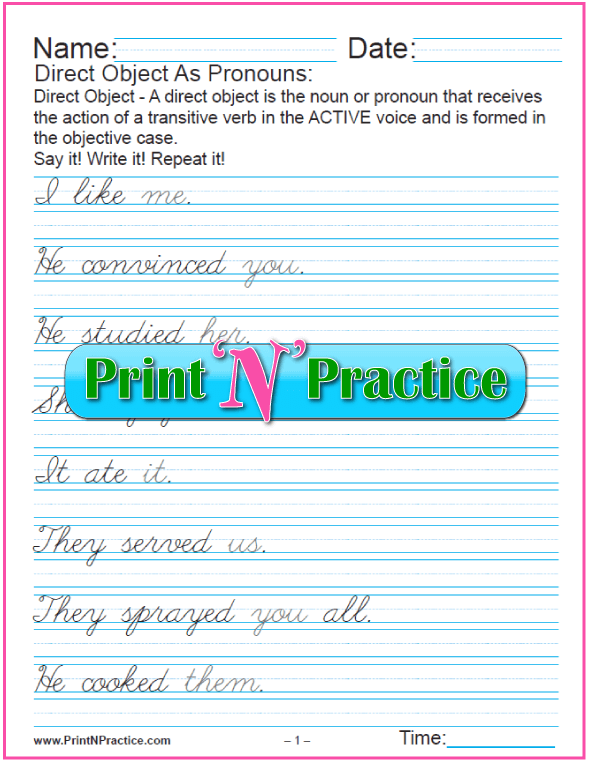 When a pronoun is used as an object (direct, indirect, or object of a preposition), it is in the objective case. Reflexive or intensive pronouns? 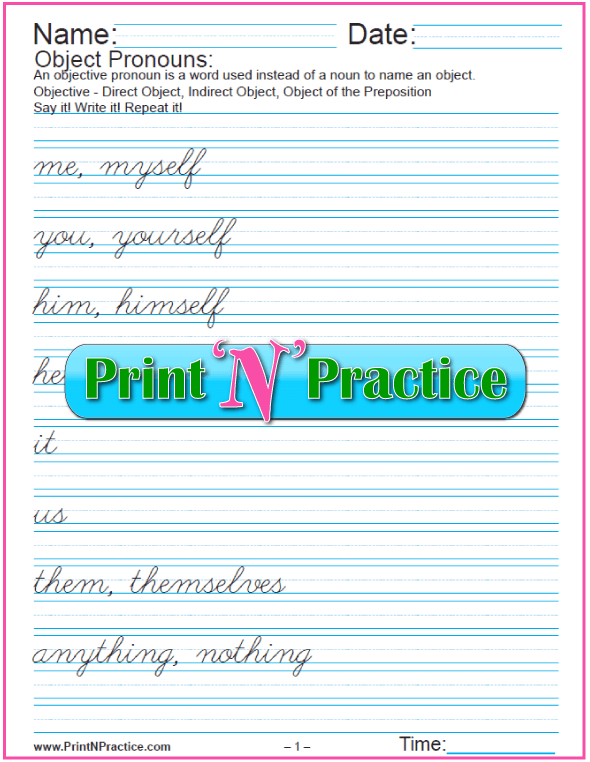 These worksheets have examples of reflexive pronouns (compound or intensive pronouns). See also compound pronouns. This set begins with a list exercise. 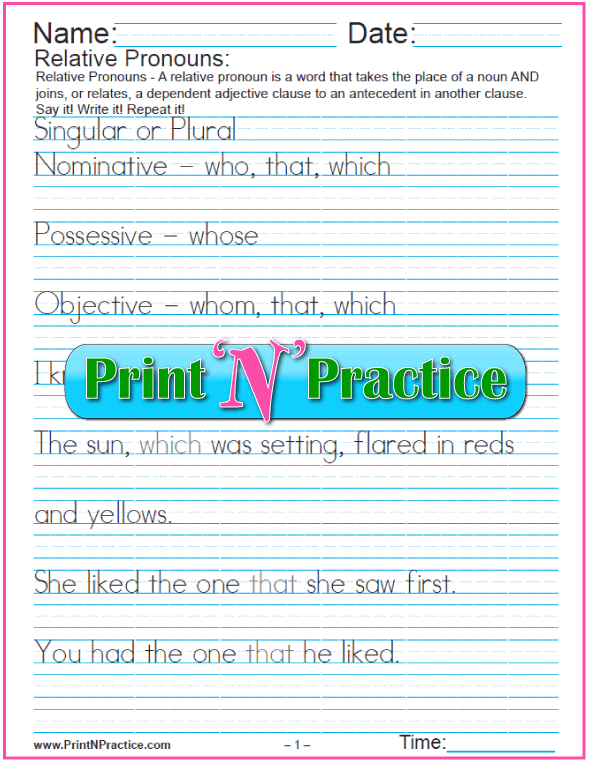 Relative pronouns take the place of nouns and join or relate a dependent adjective clause to an antecedent in another clause. The sun, which was setting, radiated throughout the sky. Hint: They, their, theirs, and them are neuter personal pronouns. Simply change the y of "they" to i or m if you are speaking of people or things. What are Personal Pronouns, Compound Personal Pronouns, Reflexive Pronouns, Self Pronouns, And Intensive Pronouns? They are all defined by the way they are used either to reflect the antecedent or to emphasize the antecedent. Oneself may also be written as two words - one's self. Pronouns of place speak of position. 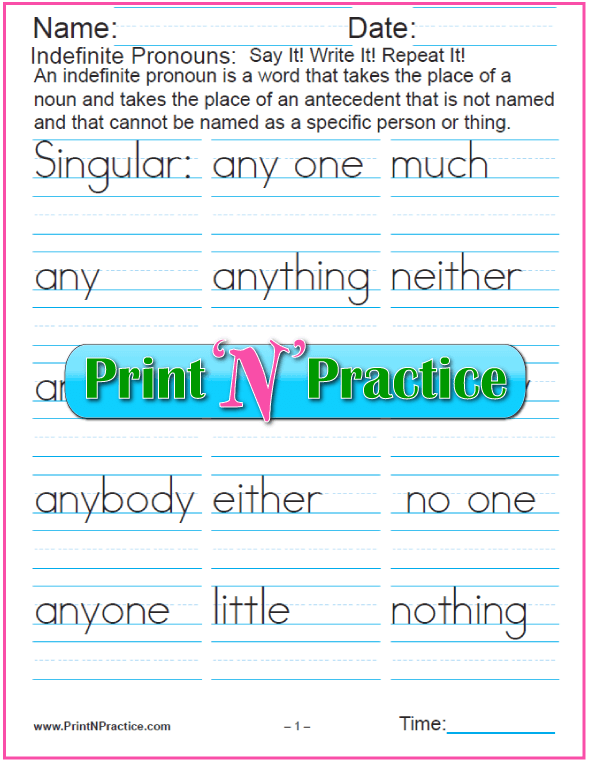 You might also like our noun, adjective, and verb worksheets. Thank you for visiting our printable pronoun worksheets.